More and more of my life is hidden behind a password, however a single point of failure is not desirable. Therefore I’ve activated two-factor authentication for almost every service I use, including my own servers. 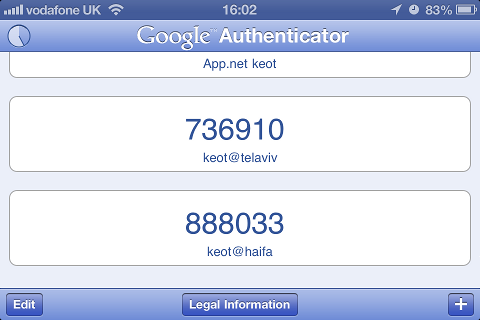 Using Google Authenticator on my iPhone, someone nasty now needs both a knowledge (e.g. a password) and a possession (e.g. my mobile phone) to access my accounts. For my home servers [plural…] I’ve started to use libpam-google-authenticator to boost my security. For normal use, public key authentication is adequate for securing my home media and backups. However, occasionally I want to access my machines from a different location, such as a friend’s computer. The simple solution would be to re-enable password authentication, but I prefer to keep my log-files small. Two-factor authentication is the solution. I have two servers at home, one running Debian 6 (Squeeze) and another running Debian 7 (Wheezy), and these instructions work for both. Proceed through the questions—I went with yes, yes, no and then yes—then scan the code with your Google Authenticator App and make a note of your emergency scratch codes. If you ever need to see the codes again, you’ll find them in ~/.google-authenticator. Now whenever you login using password authentication, libpam-google-authenticator will proceed to ask you for a verification code from your iPhone. To test this (assuming you have public key authentication enabled) try to login by disabling public key authentication (e.g. 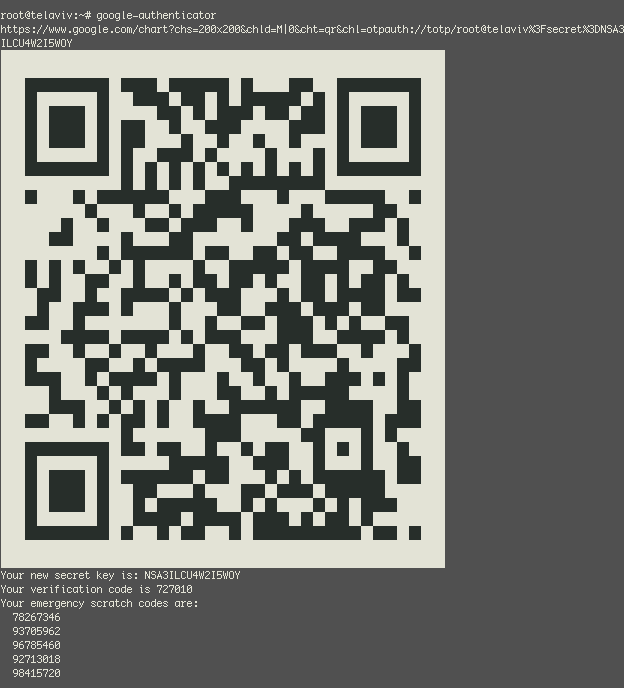 ssh keot@telaviv.local -o PubKeyAuthentication=false). Thanks to highball.se and Francis Tang for their articles on this topic.